In this article, we'll look at how (with not too many lines of code) we can build a similar app that runs in the browser. It will transcribe and translate speech using the browser's microphone and broadcast the results to other browsers in real-time. And because we are using serverless and fully managed services on Azure, it can scale to support thousands of audience members. Best of all, these services all have generous free tiers so we can get started without paying for anything! 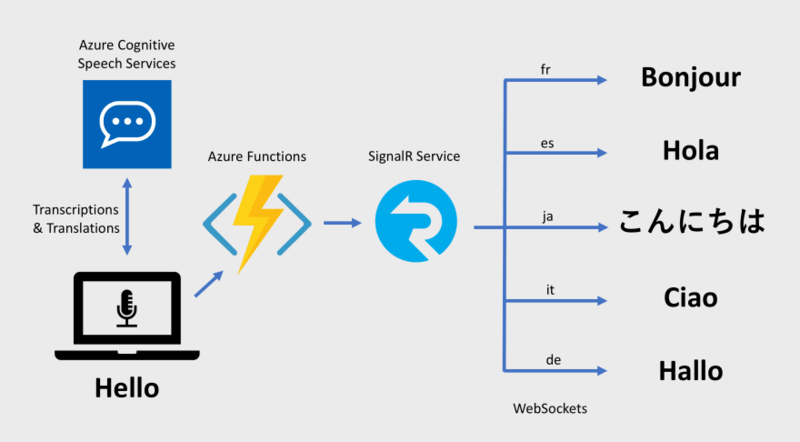 An Azure Functions app providing serverless HTTP APIs that the user interface will call to broadcast translated captions to connected devices using Azure SignalR Service. You can also create a free Speech Services account using the Azure portal using this link (select F0 for the free tier). Azure SignalR Service is a fully managed real-time messaging platform that supports WebSockets. We'll use it in combination with Azure Functions to broadcast translated captions from the presenter's browser to each audience member's browser. SignalR Service can scale up to support hundreds of thousands of simultaneous connections. You can also use the Azure portal to create one by using this link. And that's it! The recognizerCallback method will be invoked whenever text has been recognized. It is passed an event argument with a translations property that contains all the translations we asked for. For example, we can obtain the French translation with e.translations.get('fr'). Now that we can obtain captions and translations thanks to the Cognitive Services Speech SDK, we need to broadcast that information to all viewers who are connected to SignalR Service via WebSocket so that they can display captions in real-time. First, we'll create an Azure Function that our UI can call whenever new text is recognized. It's a basic HTTP function that uses an Azure SignalR Service output binding to send messages. The output binding is configured in function.json. It takes a SignalR message object returned by the function and sends it to all clients connected to a SignalR Service hub named captions. When an audience member decides to join the captioning session and our Vue component is mounted, we'll start a connection to SignalR Service. Whenever a newCaption event arrives, the onNewCaption callback function is invoked. We pick out the caption that matches the viewer's selected language and add it to the view model. Vue does the rest and updates the screen with the new caption. We also add some code to disconnect from SignalR Service when the Vue component is destroyed (e.g, when the user navigates away from the view). And that's pretty much the whole app! It captures speech from the microphone, translates it to multiple languages, and broadcasts the translations in real-time to thousands of people. To solve problems like this, SignalR Service has a concept called "groups". Groups allow the application to place users into arbitrary groups. Instead of broadcasting messages to everyone who is connected, we can target messages to a specific group. In our case, we'll treat each instance of the Vue app as a "user", and we will place each of them into a single group based on their selected language. Instead of sending a single message containing every language to everyone, we will send smaller, targeted messages that each contains only a single language. Each message is sent to the group of users that have selected to receive captions in that language. 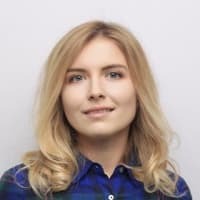 We can generate a unique ID that represents the Vue instance when the app starts up. The first step to using groups is for the app to authenticate to SignalR Service using that identifier as the user ID. We achieve this by modifying our negotiate Azure Function. The SignalR client calls this function to retrieve an access token that it will use to connect to the service. So far, we've been using anonymous tokens. We'll start by changing the route of the negotiate function to include the user ID. We then use the user ID passed in the route as the user ID in the SignalRConnectionInfo input binding. The binding generates a SignalR Service token that is authenticated to that user. There are no changes required in the actual function itself. The SignalR client will append /negotiate to the end of the URL and call our function with the user ID. Now that each client connects to SignalR Service with a unique user ID, we'll need a way to add a user ID to the group that represents the client's selected language. We can do this by creating an Azure Function named selectLanguage that our app will call to add itself to a group. Like the function that sends messages to SignalR Service, this function also uses the SignalR output binding. Instead of passing SignalR messages to the output binding, we'll pass group action objects that are used to add and remove users to and from groups. The function is invoked with a languageCode and a userId in the body. We'll output a SignalR group action for each language that our application supports — setting an action of add for the language we have chosen to subscribe to, and remove for all the remaining languages. This ensures that any existing subscriptions are deleted. Lastly, we need to modify our Vue app to call the selectLanguage function when our component is created. We do this by creating a watch on the language code that will call the function whenever the user updates its value. In addition, we'll set the immediate property of the watch to true so that it will call the function immediately when the watch is initially created. Now when we run the app, it still works the same as it did before, but if we inspect the SignalR traffic over the WebSocket connection, each caption only contains a single language. Thoughts? Questions? Leave a comment below or find me on Twitter. 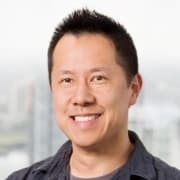 I'm a Cloud Developer Advocate at Microsoft focusing on serverless, containers, .NET, and Node.js.